In May 2010, the International Bar Association adopted the IBA Rules on the Taking of Evidence in International Arbitration — a revised version of the original 1999 IBA Rules which, in turn, had replaced the IBA Supplementary Rules of 1983. The IBA Rules serve as a resource to parties and arbitrators setting forth the procedures by which evidence is gathered and presented in international arbitration proceedings. The IBA Rules were drafted in an effort to bridge the gap between “the procedures in use in many different legal systems,” which is “particularly useful when the parties come from different legal cultures.” By all accounts, that effort has been hugely successful. Since their inception, countless arbitral tribunals — both commercial and investment — formed by members from different legal cultures — both civil and common law — have relied upon and applied the IBA Rules. However, that success has not come without criticism, the loudest of which is the perceived dominance of the common law tradition over the IBA Rules. Now the IBA Rules face their first major challenge. In December 2018, the Prague Rules are due to be published in their final form and signed in the eponymous city. These rules will set out a different approach to arbitration, more akin, the drafters say, to the procedure in civil law jurisdictions across continental Europe and the Middle East than to common law England or the United States. The aim of the new rules, according to the drafters, is to "reduce the duration and costs of arbitrations" and increase their efficiency by abandoning the need to disclose vast amounts of documents. The impetus for a new set of rules came from a discussion at the Russian Arbitration Association, or RAA, Annual Conference in Moscow in 2017. Attendees decried the common law system and its "overloading" of the process with large amounts of documents and expensive discovery exercises which led organizers to ask if there was a "creeping Americanization of international arbitration". These are certainly fighting words but what, in contrast to the IBA Rules, do the Prague Rules actually offer? "Generally, the Arbitral Tribunal shall avoid extensive production of documents, including any form of e-discovery." Contrary to the Prague Rules Working Group's assertion that "it is very rare, if ever, that document production brings a smoking gun to light," as many practitioners know, documents do win cases, and e-discovery is now a fundamental part of proceedings. Using technology to sift and sort documents is essential in modern arbitration. The risk of not conducting a thorough search leaves the award open to challenge in the event documents do later appear, which is a risk clients are unlikely to accept. Decrying the use of e-discovery today is like the lawyers of yesteryear complaining about the introduction of the telex. Just as the telex paved the way to fax machines and then email, some form of e-discovery is surely here to stay. Nevertheless, the Prague Rules may well be attractive to cost-conscious clients who seek to limit the scale and scope of disclosure. The Prague Rules also provide the tribunal additional, wide-ranging powers and authority; as a result, a case could quickly take on a life of its own. Article 2 enshrines the proactive role of the tribunal and mandates that a case management conference be held without "unjustified delay", at which point the relief sought by the parties, the agreed facts and the legal grounds substantiating the parties' positions will be clarified. This is a substantial burden early on in proceedings. While it would be usual to hold a directions hearing, it appears that the Prague Rules envisage a substantive hearing more akin to resolving an application for summary judgment of a claim or strike out of a defense. In Article 9, the tribunal is given a role in assisting the parties to reach an amicable settlement and, to facilitate an agreement, the tribunal may provide a form of early neutral evaluation. As well as having the ability to provide early neutral evaluation, the tribunal — or any of its members — can mediate the dispute and, with permission of the parties, return to the arbitration. This is a novel approach, but it is easy to envisage claims of bias and other grounds for challenge based upon prejudice appearing where the tribunal flits between roles as mediator and arbitrator in proceedings. The above are the key differences but, on closer inspection, the Prague Rules are more similar in scope and likely effect to the IBA Rules than the drafters of the former would care to accept. Both the Prague and IBA Rules provide the tribunal with the latitude to consider issues early in proceedings and, if appropriate, make a determination. 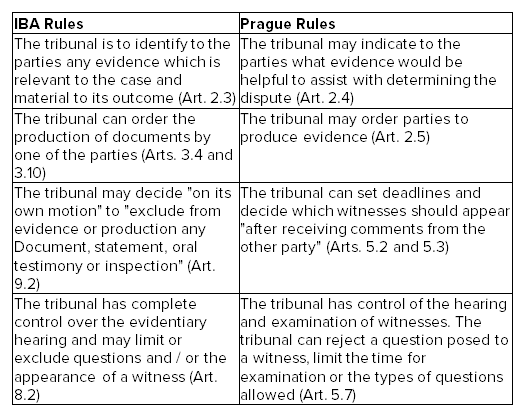 Under Article 2.4 of the Prague Rules, the tribunal has the power to indicate to the parties "the evidence… [the] Tribunal would consider to be appropriate to prove the Parties' position" and at Article 2.5 to "order the Parties to produce evidence". The above is not so very different from the powers already provided to the tribunal by the IBA Rules. At Article 2.3 of the IBA Rules, the tribunal is encouraged to "identify to the Parties… any issues: (a) the Arbitral Tribunal may regard as relevant to the case and material to its outcome; and / or (b) for which a preliminary determination may be appropriate". Articles 3.4 and 3.10 of the IBA Rules also allow for the tribunal to request and then order the production of documents by one of the parties. The similarities do not end there, and there are even some instances in which the IBA Rules seem to offer greater control to the tribunal than would be available under the corresponding Prague Rules. 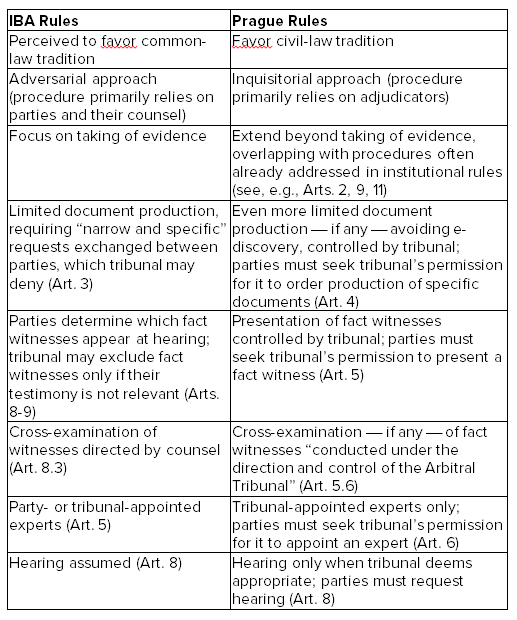 For instance, as one might expect, under both the Prague and IBA Rules the tribunal has the ability to set deadlines and decide which witnesses will appear during the hearing for cross examination. However, Articles 5.2 and 5.3 of the Prague Rules provide that the tribunal's decision will be taken "after receiving comments from the other Party". In contrast, the IBA Rules allow a tribunal "on its own motion" to "exclude from evidence or production any Document, statement, oral testimony or inspection". On this front, the IBA Rules allow the tribunal to take a more pro-active case management approach than would be permitted under the Prague Rules, even though the latter was supposedly designed to encourage such an approach. Indeed, the IBA Rules are explicit that the tribunal "shall at all times have complete control over the Evidentiary Hearing" and may limit or exclude any question, answer or appearance of a witness (Article 8.2). The Prague Rules have adopted similar language, stating that "examination of the fact witness shall be conducted under the direction and control" of the tribunal, with similar powers to reject a question or impose restrictions on the time allowed. The rhetoric and ambition of the Prague Rules, as set out in the RAA Annual Conference and in the Working Group's note, suggests that there was a clash of ideologies between common and civil law jurisdictions. However, as demonstrated in this article, adopting the Prague Rules is unlikely to significantly change the conduct of any arbitration, notwithstanding the luddite approach to e-discovery. It therefore begs the question whether any practitioner or client, outside the Commonwealth of Independent States, is likely to adopt the Prague Rules. For now, these remain mere proposals. We will have to wait and see what the published version has in store for us in December, when international arbitration professionals receive an early Christmas present on 14 December.